The Bosch GLM 40 Laser Distance Measurer is designed with the brand's patented technology for precision laser measuring. It is a handy device that gives an instant measurement of distance, volume, and area This tool has a range of 40 meters and it comes with an option for measuring in feet or meters. It has an accuracy of .02mm/m which makes it perfect for both household and professional measurements. This tool has a built in memory that stores the last 10 measurements and various utility functions. It is compact and fits easily into a pocket. Not only is it made from durable, long-lasting materials, but it is also splash proof and has dust protection which makes it ideal to use in all kinds of environments. The Super-Efficient Laser Measurement Device From Bosch Measuring has never been this simple. This device makes it super easy to put together your wardrobes, chests, and tables. The pocket-sized tool allows you to measure like a pro thanks to the engineer's precision from Bosch. 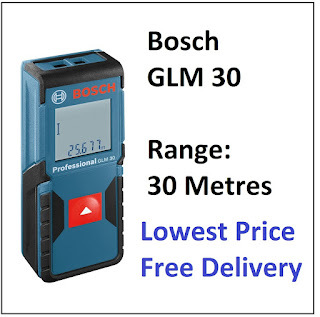 The Bosch GLM Laser Distance Measurer is the ultimate laser measuring tool that gives you accurate results within large areas in the range of 0.5m to 40m. The sleek and smart construct from the well-known brand makes this tool the best choice when working on any home installation tasks. It allows you to take measurements at the click of a button. This device is strong and built to last. It comes with a simple and easy to use interface and has a long battery life. Bosch GLM Laser Distance Measurer Device Features Functionality This tool from Bosch works with the utmost ease. It displays results that are accurate and is ideal for working on interior projects. It's also extremely easy to use When measuring the length of an area, just position the GLM 40 Laser Measure and then click the red button in the center of the device. For continuous measurement, simply move the device up to the required length to achieve the desired results. The same process applies when measuring area and volume. Once you get the result, you can add or subtract the next measurement using the device's addition or subtraction function. Alternately, you can scroll up or down using the +/- buttons. This tool has an IP54 rating and a carry on facility which makes it an excellent choice for all your measuring tasks. Battery Life This product from a leading manufacturer has laser technology precision and offers an amazing battery life which can last for about 5,000 individual measurements. Compact and Smart Design This pocket-sized laser measuring tool takes the stress out of your measurements of DIY assemblies. In addition to being small and convenient to carry, this unit is also designed with a soft grip for easy handling. The soft grip and portable size of this device offer great flexibility when working on projects. In addition to that, it has a three line display feature which ensures that readability and review of results is hassle free. The smart design and compact size together make calculating dimensions a one person job. Rugged and Durable The Bosch XLM Laser Distance Measurer has dust resistant features as well as splash water protection. The ISO certification awarded to this Bosch product speaks to the high quality of its construction and highlights its trustworthy and reliable service in the market. Memory function When you're working for long hours, building or renovating, and continuously measuring, sometimes it's possible to forget to write down measurements, which makes your job more tedious and time consuming when you have to redo everything. With the Bosch GLM 40 Laser Measuring Tool, you will be able to access 10 of the last measurements that you made on the device. Just click on the button labeled 'Fund and you will be guided to the measurement that was saved last on the device. After that, just use the scroll function to view any of the other measurements. Mounting Cupboards Has Never Been Easier! This device is user friendly and ideal for taking perfect measurements of your walls when you want to fix storage cupboards to the wall. The precision of this tool allows for accurate horizontal line measurements for your projects and serves as a guide when you hang your cupboards. Setting Up An Air Conditioner Is A Breeze Before you get lost in the old way of measuring, use this handy tool to save yourself some time and energy. It offers an easy and accurate solution for measuring your room size to install an AC. Traditional methods of measuring for AC unit installation tend to be a little frustrating sometimes, but with the Bosch GLM 40 at your disposal, you will find that measuring the size of your room and installing your air conditioner at the ideal height is a breeze. Wallpapering In An Instant The GLM 40 laser measuring tool lets you determine the height of your walls from the floor to the ceiling as well as the length of each wall instantly. You can have the measurements noted in a jiffy. This makes it quick and easy to select your wallpaper based on your wall dimensions. Bosch XLM Laser Distance Measurer An Ever Improving Design The GLM 40 from Bosch is a creation that has managed to keep the simplicity of the GLM 15 that everyone loved while introducing some improved features that make it even more convenient to use such as the backlit display. Bosch introduced various new laser products at the World of Concrete. While they didn't come right out and say it, the implication was that they intended to be a major player when it comes to the job site laser sector. After the GLM 15 Laser Distance Measure came the GLM 35 and then the GLM 40, both of which exhibited vastly improved features on the GLM 15 which has a one-button use and only one function of simply measuring the distance from one point to another. The Bosch 40 has built on that compact platform, increasing the range while at the same time adding volume, area, and indirect measurements. First Impressions of the Bosch GLM 40 Laser Measure The Bosch GLM 40 Laser Measure is delivered in a clamshell package. It comes with the two AAA batteries that are required. It hasenhanced housing as compared to the previous versions and comes with five buttons for improved use (as opposed to the one button found on the GLM 15). The GLM 40 also has rubber overmold around the sides, top, and the control panel which is great for protecting the device in case you should drop it, although it could be better if the overmold was extended around all of the edges of the device. The housing of the GLM 40 has a slightly bigger footprint in length, height, and width but it's still very manageable and easy to handle while measuring. The extra added features in the GLM 40 make it more attractive to pro users. It has some useful additions such as a sheath with a belt loop and a lanyard (a useful feature which isn't in the GLM 35). The lanyard loops into the bottom left corner and it is not as obvious as some lanyard holes. This tool also comes with a target card and a name sticker, the inclusion of which is something that many may appreciate. Bosch GLM 40 Laser Measure: Specs and Features A lot of improvements have been made to this new Bosch laser measure. The GLM 40 has a range that goes up to 135 feet and the accuracy is improved from the previous versions. The precision of this tool now allows you to read results to the nearest 1/32' as opposed to 1/16'. With this increase in accuracy will certainly come more confidence in cabinetry, countertop, and woodworking applicatoins. The GLM 40 also features a backlit screen which greatly improves visibility when working in dim conditions. Product Specifications and Technical Data - Bosch GLM 40 - Power Source: 2 x AAA batteries- Range: up to 135 feet- Accuracy: 1/16, Precision: 1/32% Measurements: Continuous distance, length, volume, area, addition, and subtraction- Memory Storage: Ten measurements- Dust/Water Protection: IP54- Run Time 4 hours- Weight: 022 lb- Warranty: 2 years- It Comes With:A Pouch, Hand Strap, Manual, Hand Strap, and 2 x AAA batteries Using the Advanced Features of the GLM 40 Laser Measure Taking measurements for basic distance with the Bosch GLM 40 is extremely easy. Simply turn the unit on using the power button and then press the red arrow to take the measurement. Continue with the process in order to hold up to three measurements on screen. The GLM 40 model is calibrated to measure starting from the back of the device, just like all laser measures available on the market today. This tool is very simple to operate and the learning curve is short. Finding volume, area and indirect measurement is easy and the majority of users will be able to do this without having to consult the manual. Advanced Functions: As soon as you turn the unit on, it goes into continuous measure mod. You can scroll through the functions using the function button. There is a helpful icon that you will see on the screen to let you know which function you're on As you press the button, you will be able to move through the five various functions which are Continuous measure (this is the one that is on at startup), linear distance (you will see this one without continuous measure on), volume, area, and indirect measurement. In order to eliminate guesswork, the GLM 40 flashes the measurement that you're taking in volume, area, as well as indirect modes. Just press the red arrow button if you want to turn the laser dot on and take your measurement. That's all there is to using this handy little device. Included in the Package: - Pouch- Hand Strap- Target Cards- 2 x AAA batteries- Manual Pros of the Bosch GLM 40 Laser Measure - Length, Distance, Volume, Area, Continuous Measurement, Addition and Subtraction- Stores up to ten measurement, Backlit screen for increased visibility- Pocket sized for easy access and use anywhere Cons of the Bosch GLM 40 Laser Measure. 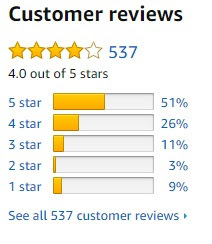 There aren't any negative things to say about the Bosch XLM Laser Distance Measurer as of yet, even the online reviews from actual customers are mostly positive. What Customers are Saying: "I don't know how I ever managed to get things done before I bought this product. My job requires that I do lots of estimates for my crew, so I find that a lot of my time is saved thanks to the feature which allows me to add measurements. At first, I was a little skeptical of the accuracy of this device, but after using it for some time, lye found that it's much better than tape measures, particularly over longer distances where tape rules can bend.' "I used to measure house dimensions using a huge rolling wheel. Once I got this Bosch, things became so much easier form. It's a great tool for fast and easy measuring and I really love the back light which makes it easy to read the measurements. In Conclusion The bottom line is that the Bosch GLM Laser Distance Measurer allows for comfortable handling and navigation. It generates accurate length, volume, area, continuous, and simple Pythagoras measurement. It has an ergonomic design which makes this product conveniently easy to carry around and use anywhere. It also has dust and water resistant qualities, meaning that you can safely use it in all kinds of conditions. All in all, whether you're a professional craftsman or a beginner with a new DIY to-do list, this is the ideal tool for you to get started with.